The total market size for organic packaged food and beverages in Argentina in 2017 is US$22.7mn. The country ranks as the 39th largest market in the world by value. Per capita spending on organic packaged food and beverages in Argentina is US$0.51, which ranks as the 38th largest spending per capita in the world. The largest company by sales in organic packaged foods and beverages is Las Brisas SA, which maintains 18.6% of total sales. Las Brisas is followed by Maoar SRL and AMS Group – Nature Crops. Organic packaged food and beverages will see strong year-on-year growth of more than 40% in 2018. This is much higher than the rest of the Latin America region, which will experience approximately 9% year-on-year growth in 2018. Argentina maintains a market size for organic packaged foods and beverages of US$22.7mn in 2017, which is 0.6% of global category sales. Within the Latin America region, Mexico and Brazil surpass Argentina in total value sales of organic packaged foods and beverages. Argentina will experience strong forecast growth of sales of organic packaged foods and beverages at a 37.4% CAGR from 2017–2022. Organic food and beverages remains a niche but growing segment for Argentinian consumers. However, inflation threatens to constrain growth in coming years if it continues to increase the already higher prices of organic products, rendering them unaffordable for many Argentinian consumers. In Argentina there is growing demand for organic food, which consumers perceive to be of higher quality and safer than conventional products, but in general, organic packaged food categories remain niche and expensive. Inflation and increasing demand for organic sweet biscuits, snack bars and fruit snacks have driven overall organic packaged food sales volume growth in recent years. Supermarkets remained the leading distribution channel for organic packaged food in Argentina in 2017, accounting for a retail value sales share of 38%, while traditional grocery retailers accounted for 81% of retail value sales for organic beverages. AMS Group - Nature Crops, a domestic company and owner of the Nature Crops brand that produces quinoa snack bars, continues growing. It distributes its products mainly in organic shops, health food stores, and Starbucks Coffee stores. 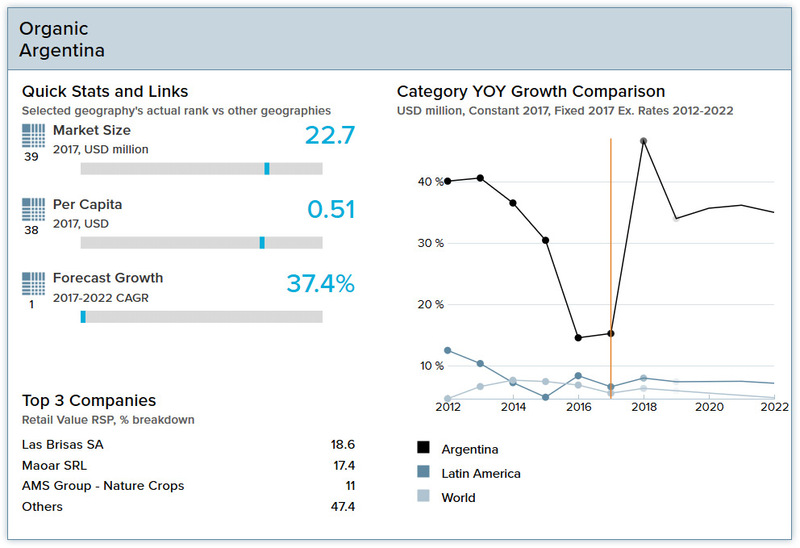 However, the organic food and beverages competitive landscape in Argentina is fragmented, with no single company capturing more than 19% share in 2017. Consumers are expected to continue searching for healthy products like organic honey and snack bars, albeit with higher awareness of their nutritional and calorie content. Organic baby food and organic sweet biscuits, snack bars and fruit snacks are projected to have the highest rates of sales value growth in the near term. Although the trend towards health and wellness products is strong due to growing health consciousness, many consumers remain value buyers and health and wellness products’ higher prices are obstacles to stronger sales growth. Perceptions of the quality and safety of these products, as well as the positive environmental impact of organic agricultural practices, help drive demand for this niche category and attract new players to the market. Argentina’s economy is finally beginning to pick up after several dismal years. Real GDP contracted by 2.2% in 2016 but grew by 2.8% in 2017, driven mainly by a rebound in private consumption and exports. Double-digit inflation continues to be problematic for Argentinian consumers, and the government has set a goal of bringing inflation down to single-digit levels by 2019. The central bank has launched an inflation-targeting scheme, but another round of energy price increases is expected. Unemployment stood at 7.3% in 2014 and will drop to 6.9% in 2015. Argentina’s population has been growing and totaled more than 44 million in 2017. 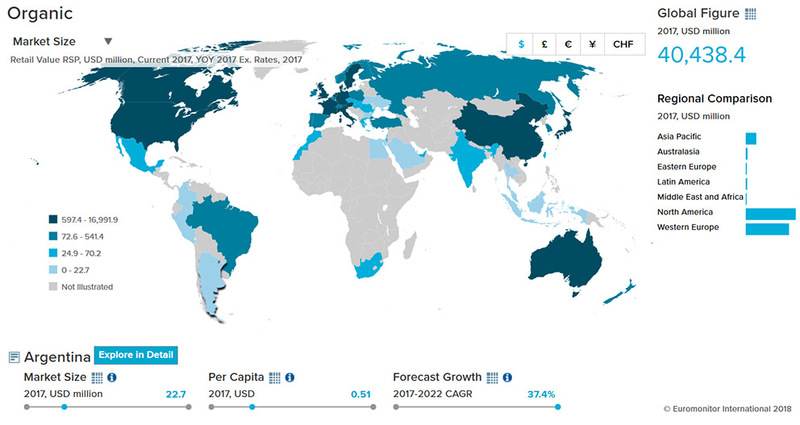 Argentina’s population is also ageing at an accelerating pace. The population over age 65 currently represents 11% of the total population and will grow to be more than 13% by 2030. Argentina recorded income and expenditure growth in 2017, following drops in both measures in 2016. The continuing expansion of the country’s middle class will fuel growing consumer expenditure per capita in coming years, with communications and household goods and services projected to benefit most through 2030. Disposable income per capita was ARS158,853 (US$9,593) in 2017. The competent authority for the inspection system of organic production in Argentina is the "Secretaría de Agricultura, Ganadería, Pesca y Alimentación" (Ministry of Agriculture, Animal Husbandry, Fisheries and Nutrition), through the "Servicio Nacional de Sanidad y Calidad Agroalimentaria" (National Agrifood Health and Quality Service; SENASA). In June 1992, SAGPyA, through Resolution 423/92, established the norms for organic, ecologic or biologic plant production, and the next year, through Resolution 1286/93, those of animal production. In addition, on September 8th, 1999, the National Congress issued Act 25.127, defining the concept, scope, and authority of the application of ecologic production. Act 25.127 (in Spanish) See "General Files" below for an English translation. The production, characterization, processing, packaging, distribution, identification and certification quality of organic agricultural products. "Green" or "organic" products subject to regulations issued by the Argentine Institute of Plant Health and Quality and provisions of the this resolution. Imported products labeled as "organic" must come from a country whose organic standards have been evaluated by SENASA and found to be equivalent to the Argentine regulations on organic production. Otherwise, they must be certified by any of the Argentine certifying agencies approved by SENASA prior to export. Additional information about importing plant products (in Spanish). There are currently private sector certification bodies working in Argentina. See the list on SENASA’s Organic web pages. (in Spanish). Argentina is considered third country for the certification of organic products destined to the European Union. Argentina is applying for equivalence to the US and to Japan. Argentina's regulation is in compliance with CODEX.